Many different entities, both public and private, are property owners of land encompassed by the Abbott Marshlands. This makes coordination of Marshlands stewardship a challenging task. Between 2008 – 2010, these partners worked together to develop a cooperative plan for the entire marshlands. An outcome of the plan was to create a Council. The Council, established in 2011, works to implement goals, developed together by these diverse partners, as described in the Cooperative Stewardship Plan for the Marshlands. 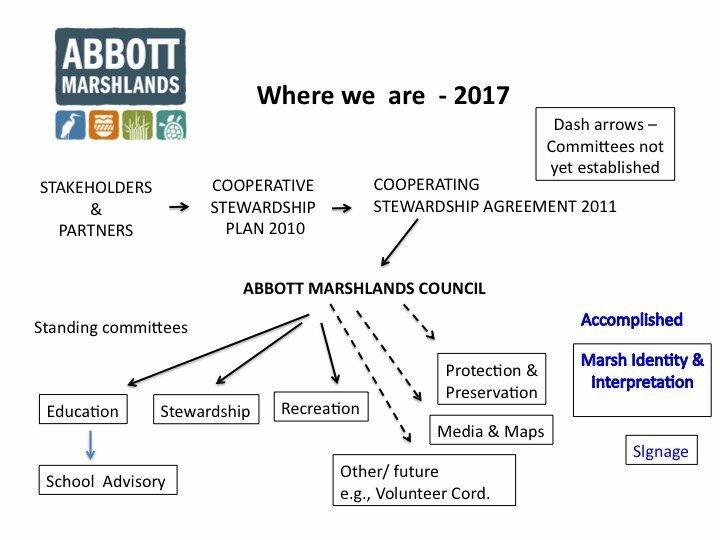 Current Organization: this chart shows the (2017) standing committees that report to the Abbott Marshlands Council.